Canvas customers return to our Provence & Côte d’Azur campsites year after year to enjoy the hours of warm sunshine, relaxed pace of life, and unique heritage of this fascinating coastline. It is one of the most popular holiday destinations in France – where uninterrupted stretches of beaches and sheltered coves jostle with traditional fishing ports, cosmopolitan resorts and tranquil hill-top villages. Canvas Holidays have a fantastic range of campsites in the Côte d’Azur, allowing you to enjoy this beautiful region at your own pace, whether that’s a spot of leisurely people-watching, or tackling a challenging cycle route. Villefranche-sur-Mer Wandering round this picturesque fishing port with its colourful waterfront, you’ll discover frescoes painted by Jean Cocteau, the museums of the historic Citadel, and the atmospheric Rue Obscure. Nice Whizz along the Promenade des Anglais on rollerblades, or hire a bike to get around the cultural sights, including the Russian Cathedral, the museum of Asian arts, and the many art galleries. St Tropez The glamorous resort of San Tropez is best known for celebrities, shopping and magnificent yachts. When you’ve finished people-watching, clamber up the rough steps to the citadel for wonderful views or visit the Musée de l'Annonciade to experience the heritage of St Tropez as a centre of avant-garde painting. On Tuesday and Saturday mornings the Place de Lices is crammed with stalls selling everything from flowers and fruits to soap and antiques. 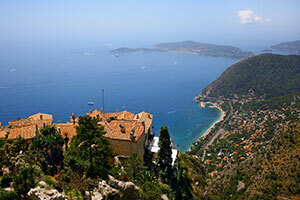 Roquebrune-Cap-Martin A picturesque medieval village dominated by its 10th century castle. Enjoy the views from the castle or the coastal path or visit the lovely frescoed church of Sainte-Marguerite. Walk though lanes and alleys so narrow, one restaurant has its kitchen and tables on opposite sides of the street! Monaco Monaco is best known for the Grand Prix, the Monte Carlo casino and its glamorous royal family. Visit the Palace to watch the changing of the guard, or stroll through the Japanese gardens dedicated to Princess Grace. Explore the impressive oceanographic museum then take a tour of this tiny principality on the delightful tourist train. Cannes Walk along the palm-lined Boulevard de la Croissette, and look out for the ‘hands of fame’ set in concrete outside the Cannes Film Festival Hall, or take a boat trip to Les Îles de Lérins for a swim and a picnic: the smaller island is home to a monastery producing upmarket wines. Discover historic Cannes by visiting the Le Suquet quarter. Grasse Grasse owes its reputation for perfume production to jasmine flowers introduced by the Moors and the irrigation required for fields of scented plants and flowers. Visit the International Perfumery Museum or tour the perfumeries – you can even book a workshop to make your very own fragrance. To find your perfect campsite in the Côte d'Azur & Provence please use our interactive site finder, call our knowledgeable customer advice team on 01 242 1901, or go straight to the individual campsite pages.